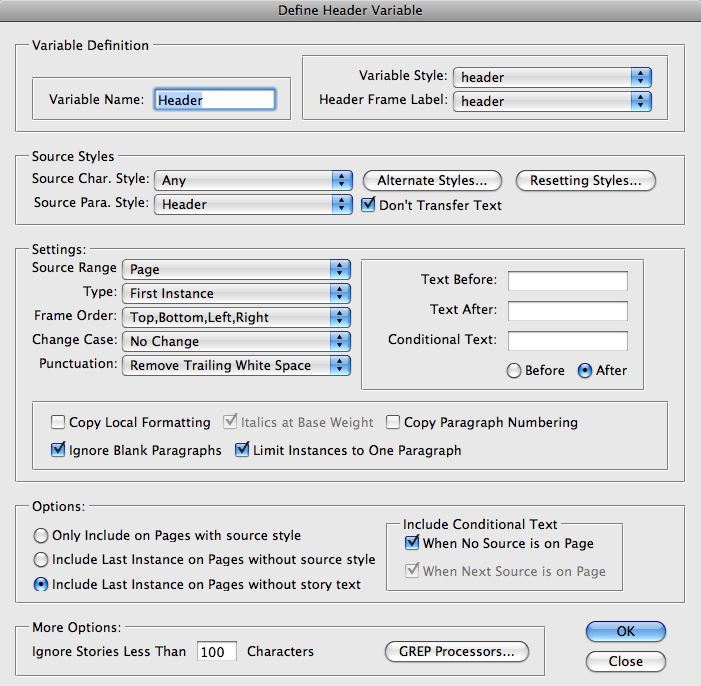 While InDesign CS3 and later does include variables which allow for the creation of headers, our Power Headers plug-in provides many, many advanced options which you will not find in native InDesign variables or any other plug-in that we know of. Below is a brief overview. For more information on what can be accomplished with Power Headers, please check out the forum here. Flexible Source Styles: Power Headers includes an option to base headers on paragraph style, character style, or both (a character style within a specific paragraph style). Spread Headers and Column Headers: Power Headers allows the selection of a “Source Range”. A source range can be “Page”, “Spread” or “Column”. This enables creating “spread reflective” and “column reflective” headers. Frame Order: Power Headers has an option to choose the frame order. The order can be either right-to-left, or left-to-right. These options are especially important in the ME version when using Right-to-Left text. The frame order can also be defined to either go down first and then across or vice versa. (4 options altogether.) This is defined at the variable level, so you can have different frame orders in the same document. “Only Include on Pages With Source Style” will only insert a header on a page which actually has text for the header. “Include Last Instance on Pages Without Source Text” will insert a header, if there’s text of a story which has text for the header. “Include Last Instance on Pages Without Story Text” will create headers from the last previous occurrence in the document. Ignore Short Stories: Power Headers has an option to ignore stories less than a specific number of characters. Book Files: Power Headers variables can be created and updated across a whole book file. Alternate Styles: Power Headers can define a single variable based on an unlimited number of styles! If you have variations on your header styles, and want the headers to reflect any of those styles, you can define “alternate styles” for your header definitions. All the defined alternates will be treated as if they are of the same style. Smart Title Case: The standard title case of InDesign is very “dumb”. All words are capitalized no matter what they are. In the real world, this is just about useless. Power Headers can create smart title case which is rule based. The underlying word list is user-definable. Localized Formatting: Power Headers gives an option to copy local (overridden) formatting to the header. It can even convert italics to the header base weight. Text Composition: Power Headers keeps the headers as live text, the text is composed by InDesign’s standard text composer. Variables on the other hand are treated as a single character and cannot break across lines. With Power Headers you can create multiple line headers with ease! Additionally, since the headers are simple text, nested styles work as expected. Punctuation: Power Headers gives a number of punctuation removal options. You even have the option to preserve multiple-lines /multiple-paragraphs in the header text. Ignore Blank Paragraphs: Power Headers offers control over whether blank paragraphs are transferred to the headers or not. While you would usually not want to create headers from blank paragraphs, this option can be used to create blank headers if needed. Paragraph Ranges: Power Headers offers the option of transferring an entire paragraph range to the header. This can be used for some very interesting applications. One example could be a side bar which can contain page reflective information. Bullets and Paragraph Numbering: Power Headers offers the option of transferring bullets or paragraph numbering to the headers. You can use this option in conjunction with the option to transfer local formatting or GREP Processors to style the bullets or paragraph numbers differently than the rest of the header text. Original Text Removal: Power Headers offers the option for the header to not contain the found text. This is useful in cases where you need the only the paragraph numbers or custom text. It can also be used to remove specific headers on specific pages. Resetter Styles: Power Headers offers the option to limit the instances of the soure text which appears in the headers. It does so by removing potential header text when it finds a “Resetter Style”. You can define multiple resetter styles, and each one can have unique settings. GREP Processors: Power Headers offers the option of applying post processing to individual header variables. The processing can change the formatting and can change the content as well. This can be used to create headers with abbreviated text or even entirely different text than what appears in the document! Global GREP Processors: Power Headers offers the option of creating Global GREP Processors as well. The difference between the local processors and the global ones is that the global ones are applied to the netire header frame, while the local ones are only applied to the individual variables. Besides making it easier to set up GREP Processors for an entire document, Global GREP Processors make possible the creation of compound headers, where different variables can interact in very interesting ways. I have two computers running InDesign. Do I need to purchase 2 licenses? If they are both used by the same user under the same version of InDesign, you can get an additional activation for the second installation. I have installed a trial version of Power Headers in InDesign CS4 (PC). On my master page, I have created a frame to hold the variable text and given it a label. I’ve created a character style sheet for the variable text. I then went to the ‘Define header variable’ menu, selected ‘new’, entered a name for the variable, selected the character style sheet under ‘variable style’, selected the header frame label and selected the source paragraph style. Then I updated document headers via the InTools: Power Headers menu. When I scroll through my document, the frame which should contain my variable text is empty. Please could you offer me some guidance on what I am doing wrong? From your description it sounds like you didn’t actually insert the variable into the header frame. The best place to ask questions about Power Headers is in the Power headers forum. Will this plugin allow me to create a running header that pulls data from a “paragraph title style” to the “paragraph running header stlyle” while retaining the GREP forced superscript of registered trademarks within the paragraph title style? The native running headers option in InDesign fails to do that regardless of whether I add the superscript GREP style to the running header style. It basically doesn’t allow a character style to override the paragraph style. Would be fantastic to find out before i go to the trouble of downloading the trial. Thanks! Power Headers can pick up local overrides. I am currently paginating a motel directory, it’s got a running header on every page showing the town name the motels listed under. running header (first on page) – running header (last on page), if there are 2 or more towns on one page, that setting works quite well. But, quite often, there is only one town name on one page, then the “running header (first on page)” is the same as “running header (last on page)”, I would get something like Auckland – Auckland. Would Power Header be able to remove one of the repeating running headers automatically? Why don’t you use the “First and Last” option? I put two variables in a headerframe. Updating shows only the result of one of them. and the result shows only the value of Head2-variable. Make sure each variable uses a different character style. You’d only want to use the same style if you need multiple variables to interact with each other overwriting the previous rendition.